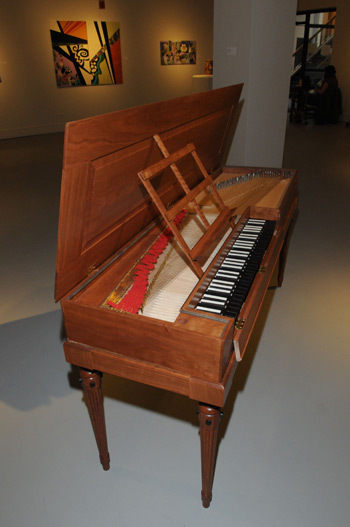 PUEBLO, CO -- A clavichord built by Colorado State University-Pueblo students will be featured at the Baroque Celebration (1600-1750) for keyboard and string instruments as part of the Pueblo Keyboard Arts Festival on Saturday, February 21. All events on the schedule are open to the public at no charge, including the featured concert at 6 p.m., which will feature Baroque works for piano, organ, string ensemble, harpsichord, clavichord, and viola da gamba. Last fall, Metchkov and four music students began construction of the clavichord, a European stringed keyboard instrument known from the late Medieval, through the Renaissance, Baroque and Classical eras. Utilizing a kit, the construction team gained skills in working with wood, stringing, drilling, and gluing. Metchkov spent the holiday break fine tuning the instrument in preparation for its inaugural concert. "Students participated in every aspect of the process all the while learning the specifics of the instrument itself and how the construction relates to keyboard playing from harpsichord to the modern piano," Metchkov said. Metchkov said while the clavichord is simple in concept - a hammer making contact with a string - it was much more difficult in construction. In addition to exploring the making of the instrument, students in the Clavichord History/Construction class discussed important elements of 16th, 17th, and 18th century musical environment in Central Europe. The course had three components: the study of historical background, the study of clavichord repertoire, and the building of the clavichord itself. The day-long Baroque Celebration is free and open to musicians and music lovers of all ages. Participants will receive hands-on experiences with Baroque instruments while learning about musical masters from the 1600s as well as the Baroque historical period. They also will hear professionals perform Baroque repertoire, including the famous Toccata and Fugue in d minor. 2-3 p.m. The Clavichord - Students will discuss the construction of the newly built clavichord and demonstrate its capabilities. 3-4:15 Masterclass - Festival participants perform in a masterclass setting. All Baroque repertoire for keyboard, cello, violin, and viola is appropriate. 4:15-5 p.m. Instrument Petting Zoo - Festival participants and audience members have the opportunity to play, explore and learn about the organ, clavichord, and harpsichord, viola da gamba, baroque violin. 6-7 p.m. Concert - Celebration of the Baroque repertoire, featuring Baroque works for piano, organ, string ensemble, harpsichord, clavichord, and viola da gamba.